Early in April I had the opportunity to go to the Whitewater center in Charlotte to see some of the Olympic trials in kayaking. But that is not what this Victory Call is about. The focus of this devotional comes from the Rock Climbing Wall at the center. We were there with 6 of our grandchildren ranging in age from 20 months to 15. 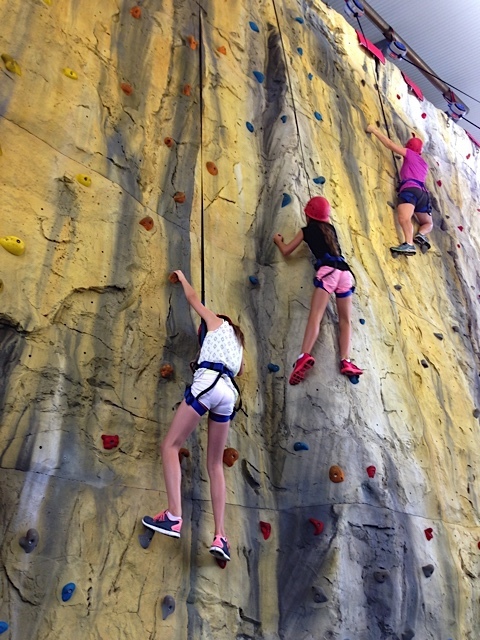 The four oldest wanted to try the Rock Climbing Wall – all girls. The 11 and 15 year old had climbed before but the 8 and 9 year old had not. It was interesting to watch their strategies. The two newbies made several attempts and got just so far and stopped, lowering themselves to the ground. They waited in line and tried again and again. As we sat and watched it became apparent they were making one tactical mistake that was preventing them from getting to the top. They started out well enough placing a foot on a toehold and grasping other holds with each hand. The first few advances up the wall went fine but they reached a point when they would place their foot on the next foothold and r….e….a….c….h to grab the next handhold but couldn’t quite reach it. They would give up and lower themselves to the ground. From their position just inches from the wall they could not see their handhold options though we, from a greater distance, could see them clearly. Their mistake? They put their foot on the foothold but they did not put their weight on it to stand on the foothold. They stayed there with their knee bent dangling more from their hands than leveraging with their feet. From that position they could not see their options. As we encouraged them to put their full weight on the toehold to extend their leg and stand up, it was then that the handhold came into reach and they were able to progress up to the top of the wall. I do hope you can visualize what I am saying because I think it is a good picture of our spiritual journey. God can see the next foothold and the next handhold even if we cannot. He may only give us our next toehold, not all the holds at one time. Putting our foot on the toehold God shows us is only the beginning; by faith we must put our weight on that toehold, extend our leg and stand up. It is often only then that our next toehold comes into view. Staying on the toehold with our knee bent is akin to unbelief. We lack the faith to put our full weight on it to stand up. From that position we cannot see or imagine the next toehold so we stay immobilized right there, not progressing in our walk of faith. We can trust God’s guidance and direction even if we cannot see the next toehold from where we are right now. It will come into view as we progress by faith. So here is the question to ask yourself: Am I firmly standing on my current toehold and by faith trusting God to bring the next one into view?